Agus an diospóireacht seo faoi phlean Fhine Gael ag dul ar aghaidh go tréan – go deimhin tá dornán litreacha ar an gceist seo san Irish Times ar maidin – ritheann sé liom go bhfuil gá féachaint arís ar ráiteas atá ag teacht chun tosaigh arís is arís eile san phlé seo. Dá mba rud é go raibh Brian Ó Nualláin ag scríobh sa lá inniu bheadh an nath cainte sin ar bharr an liosta agus é ag tabhairt faoi leagan Ghaeilge den ‘Catechism of Cliché’. Níl a fhios agam go cinnte ach creidim go bhfuil an nath cainte seo ós cionn céad bliain d’aois. Ar an mbunús sin, creidim gur ceapadh é ag am go raibh gluaiseacht eile ar bun sa tír seo maidir leis an teanga, gluaiseacht atá cosúil le na h-iarrachtaí ar bun anois ach go bhfuil an comhthéacs iomlán difriúil. Anois níl a fhios agam, mar shampla, an bhfuil an tuiscint céanna againn ar ‘anam’. Níl an tuiscint céanna againn ar an spioradáltacht anois is a bhíodh an uair úd ag tús an chéid seo chaite. Mura raibh an anam sin i mbaol roimh teacht na mílaoise seo, is cinnte go raibh sé damnaithe ar fad le linn blianta bhuacacha an Tiogair Cheiltigh agus an tír truaillithe le rachmas. Nílim ag déanamh beag – a mhalairt glan – den áit lárnach inár n-oidhreacht atá dlite don Ghaeilge. Creidim, áfach, go bhfuil gá le h-athmhachnamh a dhéanamh ar an gcur chuige atá againn ar an gceist seo. Tá tabhacht, gan amhras, le na buntáistí eacnamaíochta a ghabhann leis an nGaeilge – na páístí Samhraidh ag teacht agus an ioncam a ghineann siad do mhná tí, do mhúinteoirí, do shiopaí is eile – ach cén fath seachas sin go bhfuil tabhacht ag baint leis an dtionscal sin. Creidimse go bhfaigheann na páistí a thagann go dtí an Ghaeltacht i bhfad níos mó as an dtrí sheachtain sin ná mar a fhéadfaí bheith ag súil leis. Go minic is é an céad blaiseadh de ‘neamhspleachas’ a bhionn ann do dhéagóir – saoire le daoine chomhaosta leis i bhfad ó bhaile (ach sa bhaile) i dtír i gcéin (ach i do thír féin) le teanga coimhthíoch (do theanga féin!). Tá na scéalta ar fad cloiste againn faoi na páistí Samhraidh a chuaigh go dtí an Ghaeltacht agus ná raibh sásta le ‘Riail na Gaeilge’ nó leis an bia nó na rialacha eile. Is cuimhin liom nuair a bhíodh an Coláíste Samhraidh i gCúil Aodha gur mór an spórt a bhíodh ann – bheadh togha an bhídh sa bhaile sa chéad dul síos (bhí i gcónaí go maith ach chuaigh sé suas céim nó dhó teacht na gColáístí Samhraidh), bheadh raidhse daoine nua ann le cairdeas a bhunú leo (agus b’aoibhinn ar fad bheith id dhéagóir ag an am!) agus chuir sé ina luí orainn go raibh buntáistí ag baint leis an nGaeilge (cé go mbíodh idir Béarla agus Gaeilge idir sinn is na páistí!). Thairis sin, tá tabhacht ar leith leis an Ghaeilge san am seo ach go h-áirithe. Anois an t-am ath-oideachasú a dhéanamh orainn féin le go mbeidh samhlaíocht níos beoga agus aigne níos oscailte againn chun go mbeidh ar ár gcumas dul i ngleic le na dúshláin nua an todhchaí. Faoi mar atá sé tá an chuma ar an scéal go bhfuilimíd ag iarraidh an Status Quo a choimead. Tá daoine buartha faoi sin agus an dochar a dheinfear do gheilleagar na Gaeltachta is go leor nithe eile – is tá an cheart acu bheith buartha. Nílimse ach ag moladh argóint sa bhreis ar sin, argóint deacair gan amhras ach argóint a chuirfidh ina luí ar an bpobal, agus tríd sin ar na bpairtithe éagsúla, nach bhfuil sé ar leas na tíre sa todhchaí gad na Gaeilge a scaoileadh mar atá á mholadh ag Fhine Gael. Foilsiú: 11/02/2011 . igaeilge a d’fhoilsigh. Ranganna: An Ghaeilge, Cúrsaí Reatha. Clibeanna: Conradh na Gaeilge, Enda Kenny, Fine Gael, Irish Times, Tír Gan Anam, Tír Gan Teanga. Is cuimhin liom nuair a ceapadh Brian Cowen ina Thaoiseach – agus ba cheapachán seachas toghchán a bhí ann – go raibh dóchas éigean agam go raibh ceannaire ag an tír a thuig, b’fhéidir, go raibh gá le ceannaireacht. Thóg sé mo chroí gur labhair sé as Gaeilge ina chéad oráid – ba rud fónta é sin ar a shon agus nuair nár craoladh an mír i nGaeilge ar shuíomh an Irish Times, rinneas gearán agus fuaireas leithscéal ón eagarthóir, Geraldine Kennedy. Golf is like life. All the biggest wounds are self inflicted. Cé gur thosnaigh sé go maith agus é ag caint go macánta is, fiú, go spreagúil leis an bpobal, chuaigh sé ó mhaith go tapaidh agus ba thubaiste ‘caidrimh phoiblí’ a réim ag an deireadh. B’é a shlánaigh Fianna Fáil ag an olltoghchán deireannach – ach is cosúil go ndeinfear ollscrios ar an bpáirtí ag an toghchán seo agus gur ar fhear Uibh Fháílí a bheidh an locht á chur. Gan amhras ní raibh sé leis féin ag an mbarr. Bhí sé timpeallaithe ag lucht gaimbín agus ‘lucht sea’. Fuair lucht ‘sea’ ardú céime agus d’fhan an chuid eile ina dtost go dti anois. Ná bíodh aon dul amú ort, ní leas na tíre atá ag déanamh tinnis d’amhrasáin FF ach compórd a suiocháin féin. Níl aon cruthúnas chomh soiléir ar sin ach an socrú a rinneadh, faoi choim, go mbeadh ciste ollmhór ar fáil do Theachtaí Dála a bheadh ag eirí as ag an toghchán seo… Go deimhin beidh tuarastal níos fearr – nó pinsean más fearr leat – ag na Teachtaí is na hAirí atá ag eirí as ná mar a bheadh dá dtoghfaí iad in athuair. Má eiríonn Brian Cowen as inniu, nó i gceann cúpla lá, díreach roimh an Olltoghchán nó ina dhiaidh, ceapfaidh FF go mbeidh siad ábalta an titim tubaisteach a mhoilliú. Ní tharlóidh sin. Tá rás FF rite – agus b’fhéidir nach mbeidh FF ina fhórsa níos mó i saol na tíre. Arís ní feidir an milleán a chur ar fhear amháin – Brian Cowen nó Bertie Ahern – as sin. Tá an locht ar an bpáirtí trí cheile nó tá siad go léir chomh h-olc lena chéile. Gach duine acu ag geall leis gach deis, rinne siad an rogha éasca agus mí cheart. Cuirim i gcás an bannaí a thug FF do na bainc, an Banc Angla Éireannach san áireamh, agus Acht na dTeangacha Oifigiúla, cairt mhaorláthach gan tairbhe, na meaisíní votála Tá samplaí eile ann nach luafaidh mé faoi láthair. Na roghanna ceart: an dleacht ar mhalaí plaisteacha agus an chosc ar chaitheamh tabac. 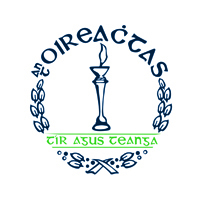 Bhí bá na nGaeilgeoirí – a bhfurmhór acu ar aon nós – riamh le Fianna Fáil. Bhí FF i gcónaí ábalta an rud ar theastaigh uainn a chlos a rá. An cuimhin libh an gheallúint roimh an Olltoghchán deireannach: go mbeadh Aire sinsearach le cúram na Gaeilge is na Gaeltachta orthu? Chomhlíon siad an gheallúint, maith go leor, ach rinne siad cuimil a mhailín den bhuiséad, rud a fhagann go mbeidh an nGaeltacht buailte níos troime ná earnáil ar bith eile ag an mbuiséad. Anois is cosúil go bhfuil Gaeilgeoirí ag féachaint i dtreo SF agus is cinnte go mbeidh na ‘rudaí cearta’ á rá ag an bpáírtí sin agus iad ag iarraidh ár vótaí a mhealladh. Ach an oiread le FF, ní dheineann SF beart de réir briathar agus, go deimhin, uaireannta is ar aimhleas na Gaeilge a ghníomhaíonn siad. Fiú má tá corr Ghaeilgeoir ‘mór le rá’ ar bórd acu, feictear dom gur pairtí é nach gcreideann i rud ar bith ach cumhacht ar son na cumhachta agus, mar a chonacthas ó thuaidh den teorainn, gur beag a dhéanfaidh siad ar son na Gaeilge agus iad i gcumhacht. Foilsiú: 16/01/2011 . igaeilge a d’fhoilsigh. Ranganna: An Ghaeilge, Cúrsaí Reatha, Cultúr, Nuacht. Clibeanna: Brian Cowen, Fianna Fáil, Irish Times, Sinn Féin. Dé Luain seo chaite bhí eagarfhocal san Irish Times ar an gconspóid faoi Willie O’Dea – agus roimh dheireadh na seachtaine, bhí an Teachta Dála imithe go dtí na cúlbhínsí. Thit sé ar a chlaíomh, is cosúil, tar éis do an bhriathar chath a bhuachaint sa Dáil oiche Dé Chéadaoin. Colm McCarthy indicated a way forward in last year’s “Bord Snip” report. He recommended abolishing the Department of Community, Rural and Gaeltacht Affairs and a critical examination of the Department of Arts, Sports and Tourism. He also cast a cold eye on the Department of Enterprise, Trade and Employment which is responsible for 14 non-commercial State agencies and more than 4,000 staff. Splitting the latter department’s functions while reallocating and merging other Cabinet responsibilities could provide more effective government. At the very least, it would get rid of dead wood. Dar leis an eagarfhocal, tá airí sa Rialtas nach bhfuil ag cothú muiníne an phobail. Mr O’Dea’s departure provides the Taoiseach with the opportunity for a fresh political start. The Government needs a thorough shake-up and filling a single vacancy at the Department of Defence will not serve that purpose. After 13 years in office, some ministers lack ideas and have become stale, detached and complacent. Others are simply out of their depth and should be replaced. Tá sé soiléir cé ar mhaith leis an Irish Times go dtabharfaí bata agus bóthar dóibh – An Aire Ghnóthaí Pobail, Tuaithe agus Gaeltachta, Éamon O Cuív, an Aire Ealaíon, Sport agus Turasóireachta, Martin Cullen, agus an Aire Fiontraíochta agus Trádala, Mary Coughlan. Tá folúntas le líonadh ag an dTaoiseach, nó is é féin an Aire Cosanta faoi láthair, ar bhonn sealadach nó, níos fearr b’fhéidir ar eagla na míthuisceana, eatramhach. Ach an bhfuil sé in am do athshuathadh níos iomláine a dhéanamh agus an deis seo a thapú anois? Ni dócha go gcuirfí Brian Lenihan san áíreamh sa reicneáil sin ach, ar maidin inniu, chaill sciaranna Banc na hÉireann suas le 11% dá luach. Le linn na deireadh seachtaine, fuair Rialtas na hÉireann luach €250m de sciaranna an bhainc sin in áit díbhinn airgid. Mar sin, roimh tosnú ar obair ar maidin, roimh bhricfeasta go deimhin, bhí breis is €27m caillte againn. Bhí an Aire Airgeadais ar an Raidió ar maidin ag cosaint an chinnidh glacadh leis na sciaranna seachas an airgead. Is cosúil gur riail Eorpach atá i gceist – nach féidir leis an Banc a fuair tacaíocht ón Stát airgead a thabhairt in áit dibhinn. Dar le Gobharnóir an Bhainc Cheannais, Patrick Honohan, is gné míshlachtmhar de phroiseas NAMA é seo. ‘Mí-shlachtmhar’ isea cur síos carthannach ar an gceist. Táim féin ‘míshlachtmhar’ – ach níor chaill mé riamh €27m roimh bhricfeasta! Nó, go deimhin, ag am ar bith. An fath go bhfuilim ag lua an sampla seo chun a chur in iúl go bhfuil easpa talainne i measc ár gcinnirí. Sin rud atá’s againn go maith. Nach sinne a thoghann iad! Ag an am chéanna, ní raibh an easpa seo riamh chomh follasach is atá sé anois. I gcead do Theachtaí Fhianna Fáil agus an Chomhaontais Ghlais, nó aon pháirtí go deimhin, ní fheictear dom go bhfuil na daoine is fearr againn chun tabhairt faoin obair atá riachtanach. Ceist ar fiú a chur: An scil ann féin an pholataíocht? An mbeadh sé éasca a leithéid a mhúineadh d’eacnamaí nó do shaineolaí oideachais nó do chomhairleoir leighis? Nó do phleanálaí teanga? Seachas polaiteoirí a cheapadh ina Airí ar réimsí tabhachtacha na tíre, an fiú dúinn féachaint ar an sampla Meirceánach agus daoine a cheapadh ina Airí atá sainscil acu sna réimsí oibre ina bhfuil taithí agus saineolas acu? Ní gá go ndeanfaí thú a dhíchailliú de bharr gur polaiteoir thú. Ach tá gá le modh oibre nua, dar liom. Níl an chóras ag obair mar atá sé. An rud atá gá leis anois féachaint go fuarchúiseach ar na dúshláin atá romhainn agus an fhoireann is fearr gur féidir linn chun tabhairt faoi na dúshláin sin a sharú. Níor cheart go mbeadh srian orainn an fhoireann is fearr a roghnú ó 166 TD – ba cheart go mbeadh pobal na hÉireann ar fuaid an domhain ábalta cur isteach ar an bpost. Nílim chomh cinnte faoi na ‘Giovanni Trapattonis’ nó na “Jack Charltons’ – is é sin eachtrannaigh a roghnú chun tabhairt faoin obair seo – ní h-é mar gheall ar chúrsaí chine nó rud ar bith mar sin. Nior mhaith liom daoine a roghnú chun teacht i dtarrtháil orainn agus ná beadh spéis ag an duine sin ach i dtuarastal agus aguisín deas don CV. Rialtas na dtalannaí atá uainn, seachas rialtas na bpolaiteoirí. Is uirlis nó scil breise an pholataíocht – ach tá gá go mbeadh níos mó ná sin le tairiscint ag an dream ar a mbronnfaimís an chumhacht. Foilsiú: 22/02/2010 . igaeilge a d’fhoilsigh. Ranganna: An Ghaeilge, Cúrsaí Reatha. Clibeanna: An Roinn Ghnóthaí Pobail Tuaithe agus Gaeltachta, Éamon Ó Cuív, Bórd Snip Nua, Irish Times. The Irish language needs to be promoted in ways that differentiate between native speakers and others. Is é sin an teachtaireacht in alt tuairimíochta a d’fhoilsíodh san Irish Times an tseachtain seo, an chéad alt substaintiúil in aon nuachtán náisiúnta Bhéarla faoin Straitéis 20 Bliain Ghaeilge a d’fhoilsigh an Rialtas an mhí seo chaite. Alt substaintiúil ó thaighdeoirí iomráiteacha agus tabhachtacha, Brian O Curnáin agus Conchúr O Giollagáin, é seo. Nochtaitear tuairimí speisiúla ann – ach, dar liom, treoraíonn an alt seo sinn sa treo mícheart ar fad. Is é an bunfhadhb atá agam leis an alt an deighilt gan bhrí agus gan bhunús a chothaítear ann idir cainteoirí dhúchais Ghaeilge agus gach éinne eile, go h-áirithe foghlaimeoirí na teanga. Is cainteoir dúchais mé féin – cé go bhfuil siad ann a chreideann nach bhfuil mo chuid Ghaeilge blasta ná cruinn a dhothain le cead cainte a thabhairt dom. Le linn mo shaoil is iomaí buntaiste a fuair mé as labhairt na Gaeilge – ‘An Deich bPúnt’ gach bliain go dtí gur fhag mé an meánscoil, Scoláireacht Gaeltachta chun freastal ar an Ollscoil agus, le déanaí, tairiscint ar dheontas chun tigh nua a thogáil im cheantar dhúchais. Ní thuigim gur spreag aon cheann den trí fheirín sin mé i dtreo na Gaolainne. Is í an Ghaeilge mo theanga, sin í bun agus barr an scéil. Ach tá teangacha eile agam freisin, Béarla go príomha ina measc sin. Dá gcuirfí deireadh le Scéim Labhairt na Gaeilge amarach -agus mura raibh an deontas ann do mo pháistí féin, bhraithfimís uainn an t-airgead gan amhras nó is mó anois é ná an £10 a bhfaighinn. Ach ní chuirfeadh sé isteach orainn agus sinn ag iarraidh ár bpáistí a thogáil le Gaeilge. An rud a chuireann isteach orainn agus sinn i mbun an mhisin seo nach bhfuil an tacaíocht phraicticiúil céanna ann dár bpáistí a saol a chaitheamh i nGaeilge – idir leabhair scoile i nGaeilge, réimse leabhair Ghaeilge inchurtha agus ar chomhchaighdeán le leabhair Bhéarla, leabhair scoile agus eile. In ait airgead a chaitheamh ar na h-acmhainní atá gá leo, tá na miliún á chaitheamh ar chaipéisí nach léifeadh ach corr dhuine chorr i mBéarla go Gaeilge – agus is lú daoine arís a léifeadh iad sa Chéad Teanga Náisiúnta. An t-aon úsáid a baineadh as Scéim Labhairt na Gaeilge le blianta beaga anuas, ba úsáid diultach é. Bhí sé á úsáid chun meath na Gaeilge mar theanga phobail a thomhas agus, anuas ar sin, chuir sé leis an soiniciúlacht i measc an phobail mhóir i dtreo na Gaeilge. Bhí sé úsáideach freisin ag lucht acadúil agus eile chun a bheith ag déanamh moltaí ní ba chraiceálte ná a cheile chun cur leis an ‘tacaíocht’ don Ghaeilge mar theanga phobail. In a crisis it is always necessary to address priorities: the kernel of the crisis in the Gaeltacht is the low number of young native speakers. We therefore strongly advise, as a matter of urgency, that priority be given to revising and strengthening SLG, as recommended in the Comprehensive Linguistic Study . This would send an immediate message as well as an injection of key supports where they are most required. The SLG is the only targeted mechanism the State has to increase the number of young native speakers, which is the starting point of all language planning initiatives. Discussions concerning the title, functions and administrative boundaries of Gaeltacht agencies may soon become irrelevant if there is no speech community for them to serve. Má tá an Ghaeltacht le teacht slán ón bpriacal ina bhfuil sí, ní tharlóidh seo de bharr Scéim Labhairt na Gaeilge agus an deighilt a chothaíonn sé idir na treibheacha éagsúla cainteoirí Ghaeilge, cainteoirí dhúchasacha agus cainteoirí atá ag foghlaim na Gaeilge. Nach féidir, mar shampla, gurb iad páistí na gcainteoirí líofa nach mairean sa Ghaeltacht traidisiúnta cainteoirí dhúchasacha an todhchaí? Ach de reir O Giollagáin agus O Curnáin, is ceist tireolaíochta amháín atá le freagairt nuair atá cainteoirí dhúchasacha á dheghilt ó chainteoirí eile. Tá an ceart acu nuair a deir siad go bhfuil gá le ‘pleanáil teanga’ chun tabhairt faoin obair mhór atá le déanamh chun meath na Gaeilge mar theanga phobail sa Ghaeltacht a chur ar chúl. Agus cé go bhfuil ana chuid cainte sa Straitéis 20 Bliain faoi seo, is beag atá déanta chun an saineolas riachtanach le h-aghaidh an obair seo a chuir i lámha iad san atá sa chéad líne ghníomhaíochta. Bhí cúpla lá agam le h-oibrithe eile sa Ghaeltacht ag caint faoi phleanáil teanga ach ní raibh a dhothain ann chun sinn a chur ar bhóthar ár leasa. Táimíd go fóill ag obair sa dorchadas, le beartais anseo agus ansiúd ach gan aon straitéis iomlán agus uile-ghabhalach ar a chúl. But realistic language planning as suggested here will increase the capacity of the strategy to achieve its stated aims, and foster support among the public as a result. Ní chreidim go bhfuil an cur chuige atá á moladh acu chun an sprioc seo a bhaint amach. A mhalairt glan. Foilsiú: 30/12/2009 . igaeilge a d’fhoilsigh. Ranganna: An Ghaeilge, Cúrsaí Reatha. Clibeanna: Dréacht Straitéis 20 Bliain na Gaeilge, Irish Times, Pleanáíl Teanga. Conradh Liospóin: Tá nó Níl? Táim chun votáil in éadan Chonradh Liospóin in ainneoin go bhfagann sin mé sa champa céanna le UKIP agus Sinn Féin, uber náisiúnaithe na Breataine agus na hÉireann faoi seach. Nach aisteach na ceillí leapan iad [sinn]? Dá léifeá an eagarfhocal san Irish Times inniu, bheithfeá den tuairim gur eagarfhocal in An Phoblacht nó fiú Saoirse a bheadh á léamh agat nó tá an teachtaireacht ‘Brits Out’ chomh soiléir sin ann! Tá’s agam go bhfuil an tir seo tar éis leas mór a bhaint as an gceangal leis an Aontas Eorpach ach ní h-ionann sin is nár iocamar praghas árd ar sin. Cuir ceist ar na h-iascairí! Nó na feirmeoirí beaga! Ach sa deireadh thiar, is ceist daonláthach í seo. Má tá Conradh Liospóin chomh tabhachtach sin do thodhchaí an Aontais, ba cheart go mbeadh gach votóir san Aontas i dteideal votáil air. Ach ní h-amhlaidh atá – creidim go bhfuil an cúram ormsa agus a thuilleadh nach mé guth a thabhairt don amhras atá orm féin agus, le cois sin, amhras an dream atá fágtha gan guth. Go fóill níl aon duine tar éis an cás a dhéanamh liom cén fath gur cheart dom votáil ar son an Chonartha céanna a dhiultaigh mé do anuraidh. Cén rud atá éagsúil anois? An bhfuil an Chonradh athruithe? An fiú tada na ‘barántais’ atá faigthe ag an Rialtas ar ár son ó cheannairí rialtais éile nuair nach bhfuil siad scríofa sa Chonradh? Má votáilim in éadan Liospóín,an vóta in éadan Aontais na hEorpa é? Ní h-é in aon chorr. D’fhéadfaí argóint gur vóta é ar son Aontas nios fearr agus níos daonláthaí. Nach é sin an rud atá ag teastáil uainn go léir! An gcruthófar aon post breise de bharr votá ‘Tá’? Níl a fhios agam seachas go gcruthófar postanna sa bhreis do mhaorlathaigh. Agus gan amhras tá maorláthaigh ag teastáil i gcónaí! An mó post a chaillfear má votáiltear ‘Níl’? Nó an gcaillfear post ar bith, sa bhreis ar na postanna atá á gcailliúint i rith an ama de bharr mí bhainistiú an gheilleagair? Ní théann teachtaireachtaí ar phostaeir ar nós ‘Stronger with Europe’ (FF) nó Vote Yes to Europe, vote yes to jobs (FG) i bhfeidhm orm. Ní chreidim na bréaga atá ar phostaeirí Cóir ach an oiread. Ag an am chéanna, tá an oiread sin amhrais orm faoin Chonradh féin agus faoin bhearna daonláthach atá ann idir Aontas na hEorpa agus pobal an Aontais. Seo seans leis an bearna sin a chungú. Foilsiú: 18/09/2009 . igaeilge a d’fhoilsigh. Ranganna: An Ghaeilge, Cúrsaí Reatha. Clibeanna: 'Brits Out', Conradh Liospóin, Irish Times.